Next to the seatbelt, the airbag is one of the most popular vehicular safety measures, and comes standard in most new and used vehicles on the road today. However, like any other component of your car, truck, van, or SUV, a mechanical failure can turn a life-saving airbag into a potentially disastrous hazard. Airbag malfunctions are usually unpredictable, and protecting yourself against something that’s meant to protect you may not cross your mind until a malfunction occurs. If you’re injured due to one or more defective airbags, then our Brooklyn personal injury attorneys will help you find the source of the problem and collect appropriate compensation to cover your resulting medical and repair bills. Faulty sensors - An airbag’s deployment is controlled by crash sensors that register when the vehicle is damaged. If the sensors are overly sensitive, or simply don’t work properly, the airbag may deploy for no reason, or it might not inflate when it’s needed, or at all. Improper angling - The airbag’s cushion should be positioned slightly upward, since your position in the seat would force your head and torso at a slight downward angle. If the airbag deploys horizontally, it may protect your torso, but your head will not have a cushion to stop its momentum. Too much power - Because an airbag must be released within milliseconds of a collision, it deploys and inflates incredibly fast. If it fills too fast, the speed and force of inflation may jar your head and body back, rather than catching and protecting them. To minimize the risk, position yourself at least ten inches from the steering wheel (measured at the breastbone), or as far as you can sit comfortably and still reach the wheel, gears, and pedals. You can also increase the distance between yourself and the airbag by reclining the seat slightly. If you can’t see the road, raise the seat (if possible), or sit on a non-slippery cushion. Though every car’s steering column is designed differently, you can usually point the airbag toward your chest, rather than your face, by angling the steering wheel downward. In most cases, this may also facilitate a firmer, more comfortable grip on the steering wheel and allow you to recline or move your seat back further. 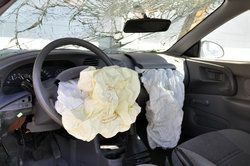 If you or someone you know is injured because of airbag failure, Gary A. Zucker & Associates, P.C. today to schedule a consultation with one of our highly-skilled personal injury attorneys.